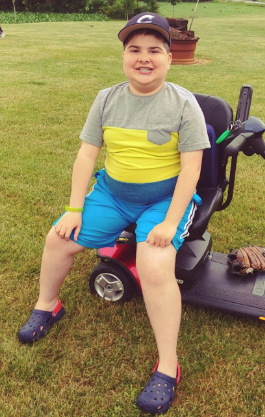 Levi is the youngest of three and was diagnosed with Duchenne at the age of 2. He was not meeting his milestones of walking and talking, our pediatrician told us that he was fine, all boys develop differently. A later blood test indicated that Levi has Duchenne muscular dystrophy. DMD is a muscle wasting disease, similar to Lou Gehrig's (ALS); it's progressive with no cure. Now at age 12 Levi is no longer walking and is getting used to his first power chair. Our entire world revolves around our three amazing sons, but specifically how we can accommodate activities for our son Levi. My husband rearranges his work schedule to help Levi with his morning routine before school, which is a tremendous help for me, as I can no longer lift Levi by myself. Lifting him in and out of our "old" van is becoming very difficult as well, which brings us to our biggest dilemma - TRANSPORTATION! Levi loves going to Phillies games, watching his older brothers play sports and going to the movies. Our new accessible van will allow Levi these simple pleasures that many of us take for granted. Handicapped accessible vans are very costly but Jett Foundation is helping us with a "matching gift.” If we raise half, they will give Levi the other half - AMAZING!!! We are humbled and overjoyed for their generosity. We hope you can assist us with a gift you find meaningful. Your gift is 100% tax deductible and you will receive tax documentation from Jett Foundation. Our dream is to reach this goal by the end of this year!